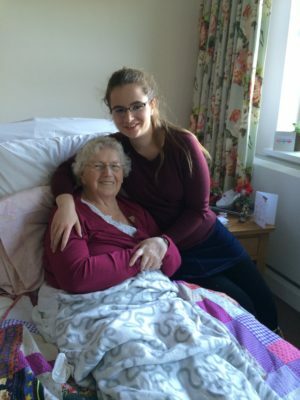 Emily Wilson will be joining Team PCA and running the Brighton Marathon in April in memory of her Grandma, Kathleen. Once again i’ll be doing the Brighton Marathon, this time for Team PCA, in memory of my grandma, Kath Buckley. Unfortunately she passed away on 15th October 2015 – just three weeks after diagnosis. She was an exceptionally active and apparently healthy woman, who was dedicated to her family and friends. She also worked in the Hospice Shop every Saturday. Her particular love for baking included frequently getting up in the early hours to bake pasties for local coffee mornings. She was a very special lady, and is very very much missed. Pancreatic Cancer is often known as a ‘silent’ cancer and symptoms are often vague and diagnosis is usually far too late. The survival rate has been just above 3% for 40 years and it is the biggest killer of all common cancers. Although my grandma was elderly, it can affect anyone of any age. With this in mind I’m going to get those running shoes back on and struggle round the 26.5 mile course in aid of this fabulous cause. I know how hard this challenge will be (having run Brighton last year), but I’m up for the fight. So far I’ve undertaken a swimathon, 10k and a half marathon to raise just over £1000 for Pancreatic Cancer charities. I would love to make the £1500 mark through this fundraiser. All this from a girl that used to come last in her schools cross country!! A huge thank you to Emily for taking on the Brighton Marathon, and for such a lovely way to honour the memory of your Grandma Kathleen.